Imran Khan can’t defy the template for power set by his Army. Don’t waste time reading his intentions, his limitations are clear. Imran Khan is right to say a war between India and Pakistan is unlikely as no nuclear power would lose. It doesn’t, however, mean that peace is about to break out. It also depends on what kind of war we are talking about. War and peace between enemies who’ve fought four wars of various sizes in seven decades, continue a low-intensity conflict through most of these and have existential fears about each other is too serious and complex an issue to be analysed in terms of events and speeches. Analysts — peaceniks and warmongers — on both sides have made that error often enough in the past. I am no exception. Over the 33 years since my first reporting visit to Pakistan (summer of 1985, to cover the trial of Sikh hijackers of an Indian Airlines plane), I have over-read the situation more than once, on the positive and the negative side. That, despite the fact that I have probably spent more time in Pakistan as a journalist than most in the Indian media. It takes you time — and patience — to appreciate the many unresolved ideological and political issues underlying our hostility. It is fashionable but juvenile to make comparisons with France and Germany. Khan is only the latest to use it, not the first. Nothing can be lazier. Neither France nor Germany was born by a division of the other. They fought many wars, but one was defeated with finality. Europe spent decades dismantling its toxic nationalism. There was America as the Big Daddy supervising this, and guaranteeing Western Europe protection. To put it brutally: This peace wasn’t reached because good sense descended on both sides. It is because one was defeated, devastated, divided and occupied by the world’s biggest powers. The first and the last opportunity for India-Pakistan peace was the Simla Agreement. We know who was insincere from the moment the agreement was signed. This is precisely when Zulfikar Ali Bhutto (an elected, civilian leader with the vanquished Army deflated) launched Pakistan onto the path of pan-Islamisation and nuclearisation. He dissed that great Simla opportunity for permanent peace as a humiliating Treaty of Versailles and began preparing for a “thousand-year war” (his early-1970s boast, repeated about two decades later by his daughter as prime minister). Bhutto Senior wanted it to be a war Pakistan would never lose again. Hence the nukes. That’s the reason Khan can stand at a solemn religious celebration and remind the much bigger India that its conventional military power amounts to nothing. Also read: Is Kartarpur a good beginning or are we being hasty to conclude Pakistan wants peace? Bhutto founded this post-1971 strategic doctrine. Let’s call it the ‘we shall never lose another war to India’ doctrine. We could argue that Pakistan lost in Kargil. But the nukes closed India’s options, or a provocation like that would have invited a full military response. By the time Bhutto was done re-toxifying his country, his Army was set to reclaim power. It has gone through challenges, particularly from two full-majority governments under Nawaz Sharif. But now the template is set. An elected government is allowed as an optical necessity. Foreign, strategic, India-US-China policies, control of the nukes, temperature in Kashmir, Afghanistan are all out of the syllabus for elected governments. In their own different ways, both Benazir Bhutto and Sharif challenged it. One paid for it with prison, exile and life. The other with prison more than once, even with key family members, exile and disenfranchisement. Khan won’t make a pretence. Since Zia-ul-Haq’s assassination and the return of some democracy, his is the first government elected and set up entirely with the institutional Army patronage. His party is truly the ‘King’s Party’ in Pakistan’s politics. To ensure his election, the guy most likely to win was barred from contesting and campaigning, jailed with his daughter and son-in-law. Numbers Khan still fell short of were “arranged” overnight. Of course, his patrons were humane enough to free his rivals once the mission was accomplished. Khan isn’t about to make the blunder of his predecessors and challenge the fauji-democracy template of divided powers. Or what an exasperated Sharif described to me once as “aadha teetar, aadha bater” (half a partridge, half a quail). Don’t be judgemental about Khan. Be realistic. On my first visit to Pakistan, eminent Pakistani lawyer, politician and activist Aitzaz Ahsan had described Zia’s party-less Muhammad Khan Junejo government as “bonsai democracy”. Pretty to look at from the outside, but never allowed to grow roots and branches outside of its little shelf-space. Over the decades, Pakistan has cemented that template. One who challenges it, goes to jail, exile, death or all three. Khan is smart, not stupid. In all evidence so far, he’s Pakistan’s first volunteer bonsai. His intentions are unclear and don’t matter. His limitations do, and these are clear. That’s the fundamental reality to remember before we get breathless over a gesture, an event, a speech, a pilgrimage. It’s a little amusing that you choose to forget the fact that Imran Khan has been the most popular sports hero in Pakistani history. He is a thousand times more popular than Wasim Akram or Shoaib Akhtar in Pakistan, or Sachin Tendulkar could ever be in India. His charisma, lack of personal wealth and family sacrifice for the sake of his political struggle has given him a Godlike stature in Pakistan’s political history, a status only enjoyed by Jinnah before him, more so after Sharif & Bhutto dynasties exposed themselves as corrupt for using their tenures in govt to raise business empires worth tens of billions of dollars each. Imran Khan went to jail for political resistance to the military during the govt of Musharraf. 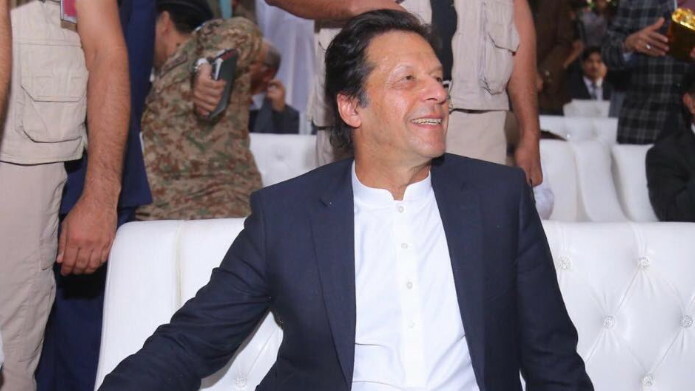 Today Pakistan’s military establishment has no choice but to stand by him, given immense ground swell of public support for his party across every region of the country. Indians only fool themselves in not taking him seriously. Brilliant piece! Your words expressed every fact, precisely! it is not as if some people were born troublesome – and others saints – it is all a question of proportion and people. People in India may not recognize Gandhi ji as a human today ( I have no personal experience of Gandhi ji) . The same is possible in any other country. Politics and Politicians are the real problem – and their views are based on a so called populations views – perceived or manipulated – behind closed doors or out in the open. the past and the future. Conditioned by the past our sheer inability to even grasp at hope is a sign of fraility and infirmity. Shekhar takes the easy way out to nail everything on military and the so called civil -military divide. It is a somewhat superficial view that misses out on societal change in Pakistan and around it in the region. Plenty of scope for fresh thinking. Mr. Gupta always writes/speaks as if he knows something that others don’t. In his need to sound clever and unique, he often sacrifices common sense. (The other day, on a TV channel, while discussing Jayant Sinha’s having garlanded some convicts, he says that Sinha’s having studied at Harvard was not germane to the issue. That means that education is not expected to make a man better. So if a man commits a wrong, his having been well-educated does not make his wrong-doing more wrong!!!!!!!!!!!!!!!!!!.). Coming back to this story, he assumes that the past is the only guide to the future. Well, Mr. Gupta is not the only person who is frozen in time; he is not the only person whose ego blinds him to the possibilities of the past not being a predictor of the future. While he has a right to to crow his opinions, what definitely bothers is this crow crows too loud, and is called a respectable journalist. SUPERB !! piece by SHEKHAR GUPTA !! Almost agreed on all points ! BUT the the press wants a straight POLICY towards PAKISTAN and they want to conclude it as early as possible to make headlines. BUT that is not how PAK policy works in INDIA . U should never have a concrete policy towards PAK as it is a military state and it is very important to keep them guessing. THE urge for peace from PAK side is new in the recent years due to their economical turmoil. BAJWA in his doctrine has called for economic relations with INDIA to survive this turmoil BUT we cant risk our security in dealing with PAK . KARTARPUR!! yes its way too risky but DOVAL has played a gamble on sikhs (one of the most loyal community) and if the economic aspects are advantageous for PAK they would never want to be attacked by terrorist groups. BUT this is where LeT and JuD come in picture their ideologies don’t permit to have relations with INDIA without resolving KASHMIR soo BAJWA is going to have a really hard time maintaing these 2 groups. INDIA cleverly has put onus on PAK to maintain the corridor without discussing KASHMIR. #Pakistan, old name Indus Valley Civilization was never part of Vedic Culture of India. Conflict between India and Pakistan is very simple its conflict on property. Now if it going to end Ramayan or Mahabharat way need to be seen. I guess would depend on your faith. India should make good use of the fact that there is no creative tension between the civilian, elected government and Pakistan’s security establishment. It has sometimes been suggested that India should talk directly to the generals, as the Americans do. My personal view is that Pakistan’s halting, tentative, not irreversible, move towards democracy is good for both countries. Whatever minimal influence India has over the evolution of Pakistan should be expended in support of that outcome. A failing, flailing Pakustan is not in anyone’s interest. 2. The fact that serious dialogue has not borne fruit should not close the door completely to dialogue, for the alternative is a continuing impasse’. So whether it is the visit of the former Norwegian PM or any other formal or informal contacts, something should keep moving. A petulant refusal to talk cannot be regarded as a self contained policy. SAARC is collateral damage. Its comatose state enlarges the vacuum which China is moving in to occupy.